Look around at a marina and you're bound to see some interesting boat names - 007, Moby Muskie Garship Enterprise - to name a few, but how did they get those names? Several years ago, I had the good fortune to spend a day fishing with then Arkansas governor Mike Huckabee. Huckabee, an avid bass angler, asked me to meet him at a boat ramp on the Arkansas River. I found him there admiring a new Bass Cat bass boat with the name “State Business” emblazoned across the stern. For similar reasons, Bassmaster magazine editor Dave Precht had a boat named Assignment, so when anybody called the office looking for him, they were told he was on Assignment. Southern Outdoors editor Larry Teague thought this was great idea, so he named his next boat Deadline. His assistant would tell callers, including me, that Teague was unavailable because he was on Deadline. The tradition of christening one’s boat goes back several thousand years—even before Christianity, from which the word “christen” is derived. We can see it as far back as the ancient Greeks, Romans and Egyptians who originally began doing it out of fear. As a safeguard from danger, most boats were named to honor a god seen as able to provide protection. By pleasing their gods with this honor, ancient peoples thought the gods would then offer the protection being sought. Ancient people also feared angering their gods by not paying homage to them in this way. Similarly, Christians would name their boats after saints, looking for their protection. Whenever the vessel wasn’t given the name of a mythical mighty ruler or god, it was common to use the name of a king, queen or religious figure. Even today, many boats are given similar names, but during the last century or so that has changed considerably. The first boat I owned was a sky-blue, cypress johnboat my friend Bubba and I built ourselves when we were just teens. With the guidance of Bubba’s dad Richard, we spent weeks fashioning the homemade craft, and when we finally were done, Richard asked what we intended to name it. After much discussion, we settled on the handle “007,” honoring James Bond, the British Secret Service agent who starred in our favorite movies. Some folks find their boat’s name in sudden inspiration. Arkansas outdoor writer Bryan Hendricks, for example, named his boat Belle of Rhymney. “I was inspired to call it that after hearing The Bells of Rhymney, a song about the victims of a Welsh mining disaster first recorded by the folk singer Pete Seeger and later by The Byrds,” he says. Tennessee angler Taylor Wilson got his inspiration from his teenaged son who forgot to tie the boat up after a duck hunting trip. “Ever after we called the johnboat Gone with the Wind and Water,” he says. Texas alligator gar guide Capt. Kirk Kirkland got his inspiration from a television show. His big river boat is aptly dubbed The Garship Enterprise, with the subtext, To the Trinity and Beyond! Many people name their boats after relatives, especially female relations. The name you select for your boat might also tell others a little about you—about your intellect (or lack thereof), your worldliness (or lack thereof) or your sense of humor. My friend Arlene Green has a bass boat named Wasted Days and a houseboat named Wasted Nights. Arkansas angler Charlie Bridwell named his first rig—a Ouachita fiberglass “bathtub” boat with a 125-hp Merc on the back—Lien on Me. Will Brantley, one of those psycho individuals who loves to dive beneath the water and catch catfish with his bare hands, named his noodling boat the Kitty Tickler. 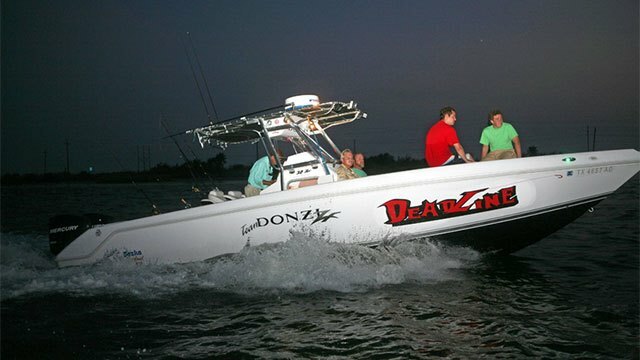 Other great boat names shared by friends include Whistlin’ Dixie, Da’Tank, Renegade, Slowpoke, Fin Reaper, The Bass Bucket, Moby Muskie, Captain Shoal Finder, Que Pasa, Dream Weaver and Wet Hen. Selecting the right name for our boats may not seem important, but, considering the love many of us have for our boats, the fact that we invest so time and money in them, the fact they feature prominently in our memories of good times with family and friends and the fact that sometimes our very lives are in the safekeeping of our boat, most of us feel that selecting the right name is something to be taken seriously. For his second boat name, Croft chose “Aiden R.” after his only son. “Kids sometimes think it’s pretty cool to have their name on a boat. It’s also a real safe bet for parents to choose, but only if you have one child,” he says with a smile. “Serenity” has been named the number-one boat name for the second year in a row with the release of the 2015 list of Top 10 Boat Names from BoatUS. It’s also the name’s tenth appearance on the popular list of boat names issued annually since 1992 by the recreational boat advocacy, service and safety group. “Calm, peaceful and untroubled is what boating is all about for so many boaters,” says Croft. Croft says boaters frequently visit www.boatus.com to get ideas for a name by taking a peek at the association’s online list of more than 8,000 boat names, then use the free and easy layout program to, “Start playing around with a boat name to get an idea of what it will look like, picking letter styles and colors.” Boaters then can choose to order online or, if they want some more creative help, may use the BoatUS Premium Boat Graphics service that offers the talents of a professional designer. An online photo gallery can also help boaters narrow down their choices. Sure, you could name your boat the Julia Scarlett Elizabeth Louis-Dreyfus after your favorite comedian. But do you want someone saying, “Could you spell that please?” when you have to send a Mayday? Names on BoatUS’s Top 10 list are easy fallbacks when choosing what you’ll christen your boat, but “the best boat names reveal something unique about the boater,” says Glenn. Some I like include Daddy’s Time Out, the name the daughter of my friend Roger Metz gave to her father’s boat; Puddle Puppy, which friend Leslie Terrell says her young son named his first boat; and Sea Section for a New Jersey gynecologist’s pleasure boat. Glenn reminds us that every boat is a “she” at heart (a core principle of maritime genetics), and says “… nothing is quite as tasteful or timeless as using a female name for your boat.” Such names never go out of style.